The R72G series has been discontinued. Please contact our Flow Engineering department for a viable replacement. 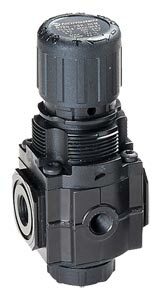 The R72G Series Air Line Pressure Regulators are designed for use as a single in-line unit or as part of a Norgren's Excelon® modular compressed air preparation supply system. As a modular FRL component, this air regulator can quickly be attached to filters, oilers, smooth start / exhaust valves, safety lockout valves and pipe adapters. With our Quickclamp® and wall bracket accessories, a complete compressed air supply system can be assembled and mounted in minutes. This compressed air line regulator is designed to allow the inlet pressure to pass directly through the body to the next component, the outlet port is at right angles to the inlet port with full flow gage ports. This allows the units to be "Quickclamped" together in a bank allowing multiple regulated pressures to be supplied from a single air supply source. * Air supply must be dry enough to avoid ice formation at temperatures below 2°C (35°F). 1/4" Port Size Air Pressure Regulator with gauge, 5 to 150 psig. 1/4" Port Size Air Pressure Regulator with gauge, 5 to 60 psig. 1/4" Port Size Air Pressure Regulator with gauge, 5 to 30 psig. 3/8" Port Size Air Pressure Regulator with gauge, 5-150 psig. 1/2" Port Size Air Pressure Regulator with gauge, 5-150 psig. 3/4" Port Size Air Pressure Regulator with gauge, 5-150 psig. 참고: Models listed include uni-directional flow, PTF threads, knob adjustment, and relieving diaphragm.